– Open the driver's door. The data shown on the identification plate is example data. This data is different for every vehicle and can deviate from the data shown here. You can find the data applicable to your vehicle on the vehicle's identification plate. In addition to being stamped on the vehicle identification plate, the vehicle identification number (VIN) is also stamped onto the vehicle body. 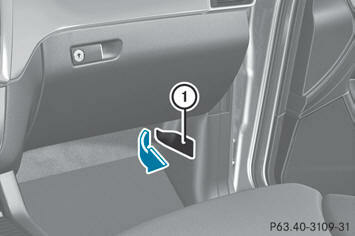 It is located in the lower part of the right-hand A-pillar. – Open the front right-hand door. 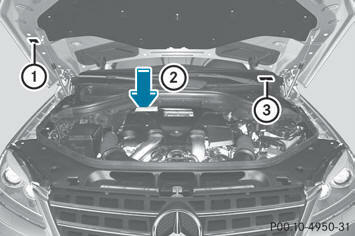 – Open cover 1 in the direction of the arrow and remove it. You will see the vehicle identification number (VIN).